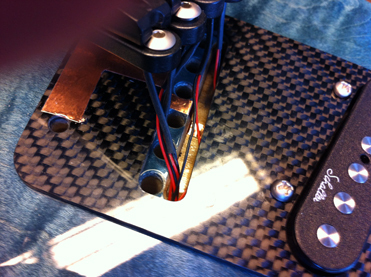 Attach the FlagShip unit with the two screws supplied or alternatively with the adhesive pad provided. 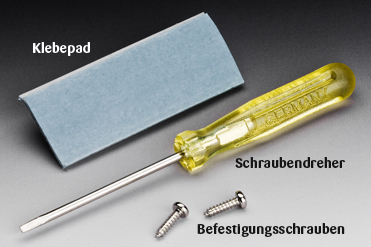 If necessary, drill suitable holes for the screws in advance. 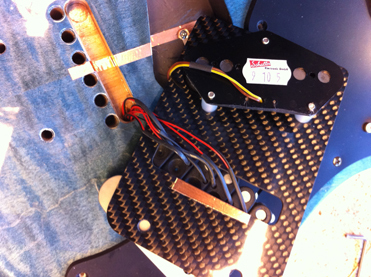 The plus and minus cable of each of the string saddles/piezo elements are bundled in the crimp connector. Simply plug the crimp connector into the multi-connector/adapter. Next plug both the plus and the minus cables of the adapter into their corresponding crimp connector on the FlagShip preamp. Screw tight with the small screwdriver provided. Plug the crimp connector into the adapter. Make sure positive (red) and negative (black) are both on the correct side of the adapter (one side only), i.e. red to red and black to black. See image below. Piezo positive (red multi-connector of the Hannes bridge) to the crimp connector marked with a red dot. Piezo negative (black multi-connector of the Hannes bridge) to the crimp connector marked with a black dot. Please note: the piezo negative is not the general shield of the guitar. Magnetic positive on the crimp connector is marked with a yellow dot. Magnetic shield on the crimp connector is not marked with a dot. For magnetically positive and negative poles, for example, the cable that was soldered to the jack plug socket can be used. Positive and negative poles that come from the pickup are to be removed from the jack plug socket by heating the solder connections. Plug this cable into the FlagShip connector ( "yellow" and "green/without" colour markings). 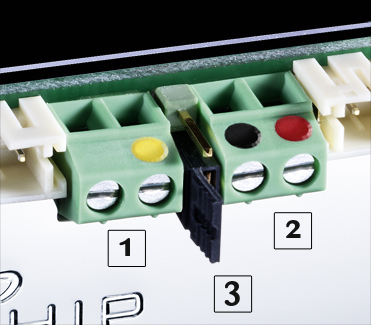 Install the new jack plug socket that is delivered with the Flagship and plug the cable connected to the amplifier into the new cable socket. The jumper can be positioned by either plugging onto pins 1 and 2 or onto pins 2 and 3 and determines whether the piezo-signal is 'in phase' with the magnetic signal or 'out of phase' - the latter providing inferior sound quality. The required positioning of the jumper is dependent on the individual switching characteristics of the guitar. For correct 'in-phase' positioning of the jumper we recommend testing 'by ear' once all connetions are made and the preamp is hooked up to an amp. This only applies to our Hannes Piezo bridges. Piezo systems with the same earthing (grounding) may need to be brought "in phase“ by reversing the existing poles on socket 1 (input for magnetic pickups). Caution: When a connection is made to pickups that are already live, the output signal increases automatically! A 9 volt battery can be used as a general power supply. Please note that piezo bridges are not earthed. Mono and stereo positions 2 through 5 feature identical controls and functions allowing for a transparent layout and easy handling. Pos 1 mono and Pos 1 stereo feature special utility settings. 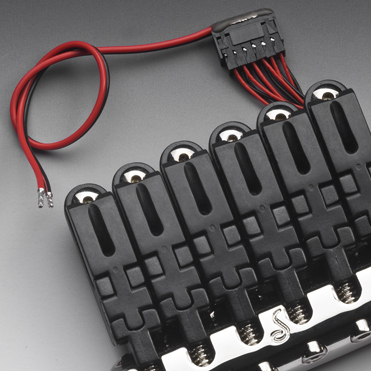 In case one of the pickup systems is not connected to the guitar's circuitry (whether magnetic or piezo), a wire tap must be connected on the respective input for effective noise reduction. 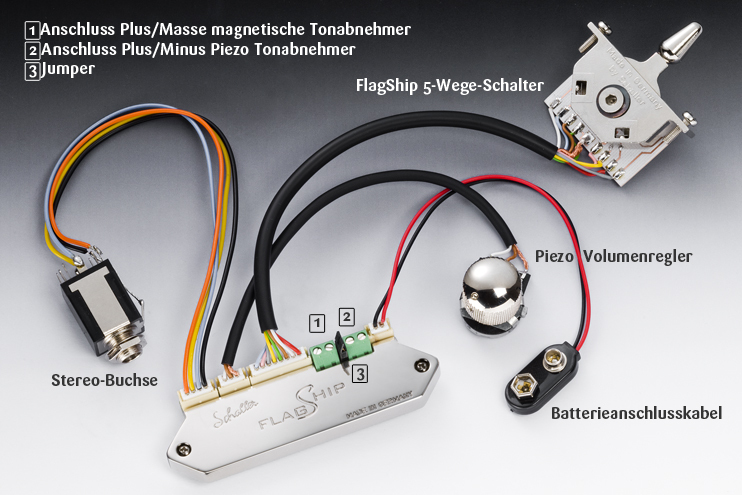 To keep electromagnetic interference to a minimum all conductive parts of the guitar must be thoroughly grounded, particularily the Hannes retainer block and the FlagShip enclosure. high impedance signal transformed into a low impedance signal, therefore unaffected by high capacitance of excessive signal-cable and/or patch-cable lengths. Another significant benefit of switching pos 4. is the buffered signal, i.e. the conversion of the high capacity passive pickup signal into a low capacity active pickup signal. This prevents sound degradation commonly associated with running extended cable lengths or using inferiour cable qualities. Your magnetic pickup signal will remain strong, clear and detailed even on the most unfavourable conditions. With this groundbreaking class A preamp your playing has never sounded better. Clear smooth highs, soulful mids and bodacious bass combined with an impressive dynamic range of 115 dB will lead your inspiration to new levels. 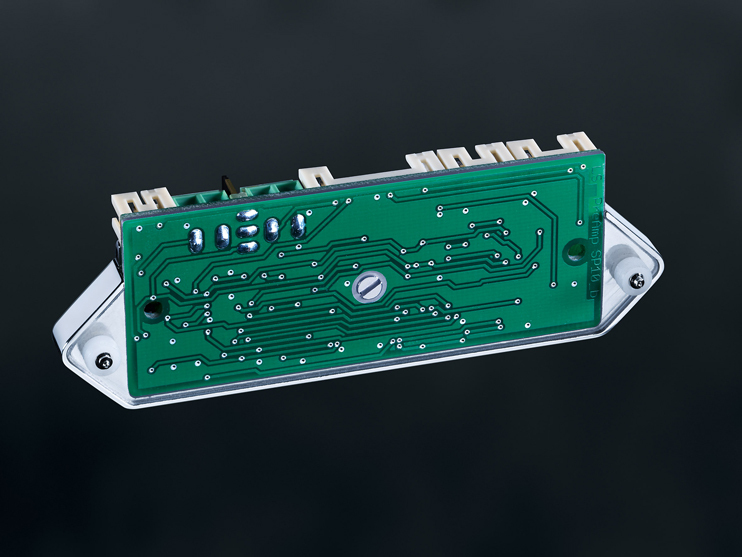 With a true bandwidth of 1Hz to 20 kHz at +/- 0 dB our state-of-the-art FlagShip circuitry provides unprecedented signal fidelity along with exceptional operational convenience. And because of FlagShip‘s leading-edge rail-to-rail technology a single 9V alcaline battery will provide you with 1.000+ hours of play time. Enjoy a self-sensing circuitry automatically switching in mono- or stereo-operation respectively by sensing which kind of chord you plugged in. In addition the FlagShip preamp offers an ultra-silent operation with a signal to noise ratio of -115 dB and a noise floor of just 20 dBµV. 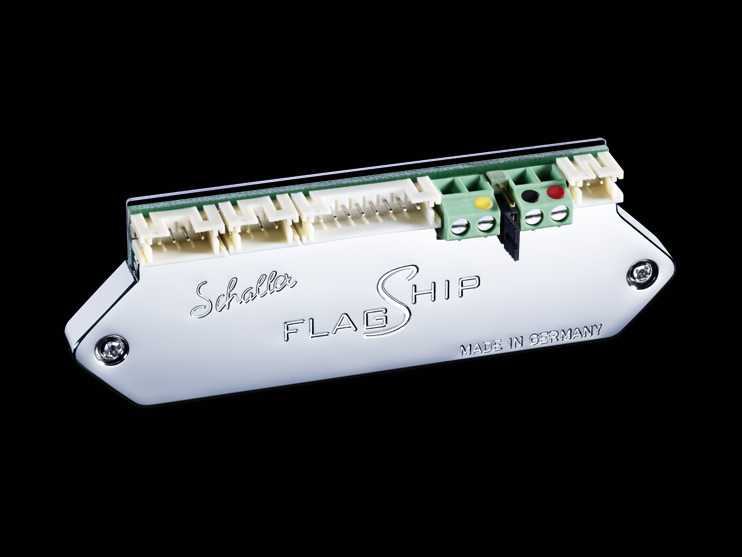 Schaller‘s own FlagShip gold contact 5-way lever or 3-way rotary switch lets you choose from a vast variety of piezo and magnetic switching options and –combinations never seen in any preamp before. Please note: The FlagShip 5-way lever or optional 3-way switch are for controlling the preamp only. 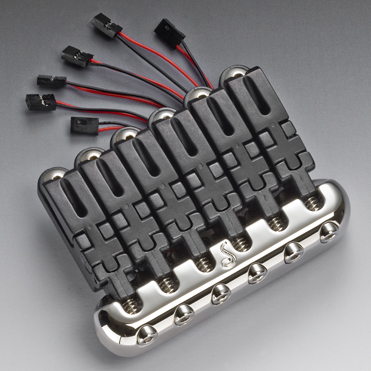 They do not replace the guitar`s 5-way lever or 3-way toggle pickup selector! Volume piezo bridge and passive pickup with variable adjustment. Supplied with a stereo jack socket. This allows the piezo and pickup signal to be separated using a stereo splitter y-cable and then connected to two different amps or channels. For mono and for stereo use the FlagShip preamp features an advanced mono / stereo self-sensing output stage. The FlagShip preamp senses whether a mono 1/4“ or a stereo 1/4“ plug is inserted and switches into the appropriate mode automatically. Not only does this prevent misuse so commonly known from mono/stereo toggle switches. It also allows for just one output jack (see stereo jack enclosed) in your guitar to operate the FlagShip to its fullest potential. In mono mode the sound of the magnetic pickups is mixed with the sound of the piezo pickups within the preamp. We recommend using a regular 1/4“ plug guitar cable. Please refer to the FlagShip manual for all dedicated sound options in this mode. In stereo mode the sound of the magnetic pickups and the sound of the piezo pickups are sent seperately to the stereo output jack. Please refer to the FlagShip manual for all dedicated sound options in this mode. Using a stereo cable with two 1/4“ plugs for routing the magnetic and piezo signal seperately to a mixing console’s stereo input. Using a Y-cable with two 1/4“ mono plugs and one 1/4“ stereo plug for splitting your signal between a guitar amp for the magnetic pickups and a PA or acoustic amp for the piezo signal. Tip of stereo plug goes to tip of mono plug left. Ring of stereo plug goes to tip of mono plug right. Sleeve of stereo plug goes to sleeve of mono plug left. Sleeve of stereo plug goes to sleeve of mono plug right. Please note that by connecting the grounds of two amps or an amp with a PA a low-frequency ground hum may occur. This is an inherent problem caused by ground loops and in no way a fault within the FlagShip preamp.